Hello everybody! As you might have noticed, we’ve been working on blog posts to help you navigate those early years as a mother (or father!). On this occasion, I would like to focus on our young company – specifically, why we are all on this journey, trying to leverage modern day technology to improve the quality of the interactions between parents and their babies. This is the first part of my blog post – stay tuned for the second part, coming next week! Neuroscience – the study of the brain and how it functions – has advanced as much in the last 20 years as it ever had. As tools that allow us to study the developing brain have improved, we’ve learned that the highest sensitivity to learning new skills occurs during the first four years of life – and drops off dramatically afterwards. This doesn’t mean that your brain stopped learning after you turned 5; only that learning something new gets quite harder. Below you can see a chart that traces the sensitivity of the human brain for developing specific human abilities over time – you’ll notice how it all goes down after the third birthday. So how do we work on developing fundamental skills with our babies during those crucial years? That is a question that had baffled researchers until a few years ago. Until a few years ago, scientist believed that temperament, basic abilities, and even IQ were completely determined by genetics and the environment. Most recently, we’ve learned that the experiences a developing baby undergoes are as crucial as the genetic code passed on by the parents. A good example to shed some light on this is a person’s height. You might think that height depends merely on the person’s genes; however, scientists have learned that nutritional deficiencies during childhood leads to stunted growth – and that no matter what’s done to remedy these deficiencies afterwards, those affected will never achieve their potential height. Just as depriving a growing child to nutrients and healthy food leads to stunted growth, depriving a baby during those crucial years of nourishing and engaging experiences may lead to deficient brain development which never achieves the healthy brain architecture its genes pre-determined. These deficiencies in brain development are shown in all four areas of development – cognitive, social/emotional, physical, and linguistic. 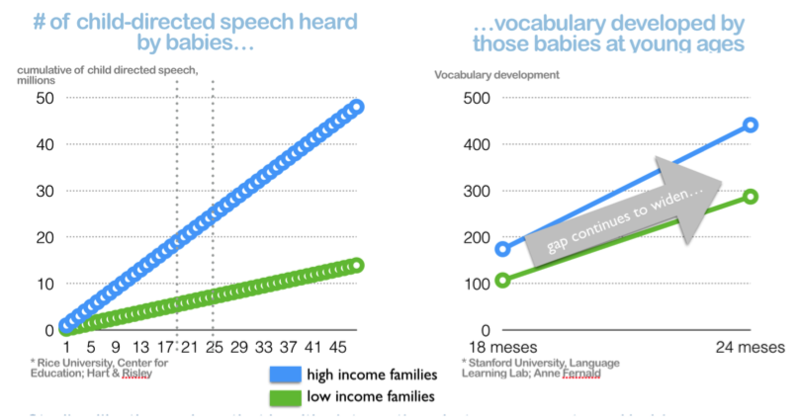 In fact, Dr. Anne Fernald, from Stanford’s Language Learning Lab, has proven specifically how early experiences affect the development of crucial linguistic skills. In a recent study, she showed how children whose primary caregivers spoke more words directly to them developed a heftier vocabulary; furthermore, the vocabulary gap only widened as time passed, as parents never improved their interactions with their babies. Hart & Risley coined the term “30-million-word-gap”, which refers to the fact that children from high socioeconomic status (SES) hear 30 million words more by the age of four than children from low socioeconomic status. In Dr. Fernald’s study, high SES babies heard about 100 words per minute of directed speech; low SES babies heard only five. And we wonder why there is such a skill gap between children by the time they enter school – at age six, it’s already too late! Dr. Fernald has been working on interventions for parents with low word counts, and her initial results show that the vocabulary gap can be closed, basically, by speaking directly to children – reading books, describing objects that surround them, singing, rhyming, and other relatively simple behaviors. Across the years, other researchers have looked at the impact of quality childcare and early education, and have shown there is quantifiable value in making sure our children are well taken care of and growing in these crucial early years. Three different studies, reflected in the chart below, have shown that for every dollar invested in quality early care, we as a society reap at least four times the invested amount! This effect is even larger when the investments target children from low socioeconomic status, which on the most part, have fewer nourishing and engaging experiences than children from high socioeconomic status. You can see the importance of the early years, and yet governments continue to underinvest in the early years – whether because of cultural issues (“women should stay home to care for their kids”) or demagogical issues (“invest in higher education, those impacted can now vote”), governments are focusing their efforts where it is already too late to successfully impact and improve development. Governments and institutions are starting to look into and invest in early development. The Obama administration pledged millions of dollars to study the developing brain; across the world, governments are taking action to provide childcare to employees, whether by company sponsored centers or by government run centers. Many are working to provide children with a safe place where they can spend their early years. But why not work directly with the parents of babies across the world? If you have questions or comments, feel free to reach out to me – luisg (at) kinedu.com. I’m happy to hear what you have to say.